Don’t wait to get your school forms filled out, epinephrine auto injectors refilled and asthma action plans. 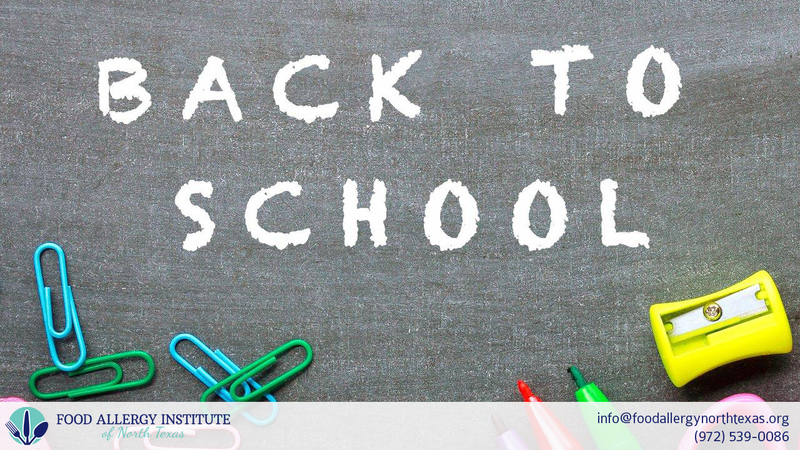 Here are additional resources to help you make going back to school with food allergies a success. Raising Awareness – tools for helping others understand food allergies and find ways to get involved. KIDS WITH FOOD ALLERGIES has the Teal Classroom™ Kit. A Teal Classroom™ encourages being safe and inclusive for everyone with food allergies. Our Teal Classroom Kit contains resources for teachers and other staff to raise food allergy awareness at school. Download and share a copy with your school. Our board-certified allergists are here to help you make this school year the best yet. Call (972) 539-0086 or email info@foodallergynorthtexas.org to get started today!